SonicWALL "Launch" Promotion: Get three years of SonicWALL's Advanced Gateway Security Suite for the price of two a year subscription, PLUS three free years of SonicWALL Capture Security Center. *Requires Qualifying Trade-up Product. Click here for details. SonicWALL "Secure Upgrade Plus" Promotion: Upgrade and get three years of the SonicWALL AGSS PLUS single-pane-of-glass cloud management via SonicWALL Capture Security Center. The SonicWALL TZ series enables small to mid-size organizations and distributed enterprises realize the benefits of an integrated security solution that checks all the boxes. Combining high-speed threat prevention and software-defined wide area networking (SD-WAN) technology with an extensive range of networking and wireless features plus simplified deployment and centralized management, the TZ series provides a unified security solution at a low total cost of ownership. The foundation of the TZ series is SonicOS, SonicWALL's feature-rich operating system. SonicOS includes a powerful set of capabilities that provides organizations with the flexibility to tune these Unified Threat Management (UTM) firewalls to their specific network requirements. For example, creating a secure high-speed wireless network is simplified through a built-in wireless controller and support for the IEEE 802.11ac standard or by adding our SonicWave 802.11ac Wave 2 access points. To reduce the cost and complexity of connecting high-speed wireless access points and other Power over Ethernet (PoE)-enabled devices such as IP cameras, phones and printers, the TZ300P and TZ600P provide PoE/PoE+ power. Distributed retail businesses and campus environments can take advantage of the many tools in SonicOS to gain even greater benefits. Branch locations are able to exchange information securely with the central office using virtual private networking (VPN). Creating virtual LANs (VLANs) enables segmentation of the network into separate corporate and customer groups with rules that determine the level of communication with devices on other VLANs. SD-WAN offers a secure alternative to costly MPLS circuits while delivering consistent application performance and availability. Deploying TZ firewalls to remote locations is easy using Zero-Touch Deployment which enables provisioning of the firewall remotely through the cloud. Our vision for securing networks in today's continually-evolving cyber threat landscape is automated, realtime threat detection and prevention. Through a combination of cloud-based and on-box technologies we deliver protection to our firewalls that's been validated by independent third-party testing for its extremely high security effectiveness. Unknown threats are sent to SonicWALL's cloud-based Capture Advanced Threat Protection (ATP) multiengine sandbox for analysis. Enhancing Capture ATP is our patent-pending Real-Time Deep Memory Inspection (RTDMI™) technology. The RTDMI engine detects and blocks malware and zero-day threats by inspecting directly in memory. RTDMI technology is precise, minimizes false positives, and identifies and mitigates sophisticated attacks where the malware's weaponry is exposed for less than 100 nanoseconds. In combination, our patented single-pass Reassembly-Free Deep Packet Inspection (RFDPI) engine examines every byte of every packet, inspecting both inbound and outbound traffic directly on the firewall. By leveraging Capture ATP with RTDMI technology in the SonicWALL Capture Cloud Platform in addition to on-box capabilities including intrusion prevention, anti-malware and web/ URL filtering, TZ series firewalls stop malware, ransomware and other threats at the gateway. For mobile devices used outside the firewall perimeter, SonicWALL Capture Client provides an added layer of protection by applying advanced threat protection techniques such as machine learning and system rollback. Capture Client also leverages the deep inspection of encrypted TLS traffic (DPI-SSL) on TZ series firewalls by installing and managing trusted TLS certificates. The continued growth in the use of encryption to secure web sessions means it is imperative firewalls are able to scan encrypted traffic for threats. TZ series firewalls provide complete protection by performing full decryption and inspection of TLS/SSL and SSH encrypted connections regardless of port or protocol. The firewall searches for protocol non-compliance, threats, zerodays, intrusions, and even defined criteria by looking deep inside every packet. The deep packet inspection engine detects and prevents hidden attacks that leverage cryptography. It also blocks encrypted malware downloads, ceases the spread of infections and thwarts command and control (C&C) communications and data exfiltration. Inclusion and exclusion rules allow total control to customize which traffic is subjected to decryption and inspection based on specific organizational compliance and/or legal requirements. SonicWALL makes it easy to configure and manage TZ series firewalls and SonicWave 802.11ac Wave 2 access points no matter where you deploy them. Centralized management, reporting, licensing and analytics are handled through our cloud-based Capture Security Center which offers the ultimate in visibility, agility and capacity to centrally govern the entire SonicWALL security ecosystem from a single pane of glass. A key component of the Capture Security Center is Zero-Touch Deployment. This cloud-based feature simplifies and speeds the deployment and provisioning of SonicWALL firewalls at remote and branch office locations. The process requires minimal user intervention, and is fully automated to operationalize firewalls at scale in just a few steps. This significantly reduces the time, cost and complexity associated with installation and configuration, while security and connectivity occurs instantly and automatically. Together, the simplified deployment and setup along with the ease of management enable organizations to lower their total cost of ownership and realize a high return on investment. Reassembly-Free Deep Packet Inspection (RFDPI) This high-performance, proprietary and patented inspection engine performs stream-based, bi-directional traffic analysis, without proxying or buffering, to uncover intrusion attempts and malware and to identify application traffic regardless of port. Bi-directional inspection Scans for threats in both inbound and outbound traffic simultaneously to ensure that the network is not used to distribute malware and does not become a launch platform for attacks in case an infected machine is brought inside. Stream-based inspection Proxy-less and non-buffering inspection technology provides ultra-low latency performance for DPI of millions of simultaneous network streams without introducing file and stream size limitations, and can be applied on common protocols as well as raw TCP streams. Highly parallel and scalable The unique design of the RFDPI engine works with the multi-core architecture to provide high DPI throughput and extremely high new session establishment rates to deal with traffic spikes in demanding networks. Single-pass inspection A single-pass DPI architecture simultaneously scans for malware, intrusions and application identification, drastically reducing DPI latency and ensuring that all threat information is correlated in a single architecture. Secure SD-WAN An alternative to more expensive technologies such as MPLS, Secure SD-WAN enables distributed enterprise organizations to build, operate and manage secure, high-performance networks across remote sites for the purpose of sharing data, applications and services using readily-available, low-cost public internet services. REST APIs Allows the firewall to receive and leverage any and all proprietary, original equipment manufacturer and thirdparty intelligence feeds to combat advanced threats such as zero-day, malicious insider, compromised credentials, ransomware and advanced persistent threats. Stateful packet inspection All network traffic is inspected, analyzed and brought into compliance with firewall access policies. High availability/clustering SonicWALL TZ500 and TZ600 models support high availability with Active/Standby with state synchronization. SonicWALL TZ300 and TZ400 models support high availability without Active/Standby synchronization. There is no high availability on SonicWALL SOHO models. DDoS/DoS attack protection SYN flood protection provides a defense against DoS attacks using both Layer 3 SYN proxy and Layer 2 SYN blacklisting technologies. Additionally, it protects against DoS/DDoS through UDP/ICMP flood protection and connection rate limiting. IPv6 support Internet Protocol version 6 (IPv6) is in its early stages to replace IPv4. With SonicOS, the hardware will support filtering and wire mode implementations. Flexible deployment options The TZ series can be deployed in traditional NAT, Layer 2 bridge, wire and network tap modes. WAN load balancing Load-balances multiple WAN interfaces using Round Robin, Spillover or Percentage methods. Advanced quality of service (QoS) Guarantees critical communications with 802.1p, DSCP tagging, and remapping of VoIP traffic on the network. H.323 gatekeeper and SIP proxy support Blocks spam calls by requiring that all incoming calls are authorised and authenticated by H.323 gatekeeper or SIP proxy. Single and cascaded Dell N-Series and X-Series switch management Manage security settings of additional ports, including Portshield, HA, PoE and PoE+, under a single pane of glass using the firewall management dashboard for Dell's N-Series and X-Series network switch (not available with SOHO model). Biometric authentication Supports mobile device authentication such as fingerprint recognition that cannot be easily duplicated or shared to securely authenticate the user identity for network access. Open authentication and social login Enable guest users to use their credentials from social networking services such as Facebook, Twitter, or Google+ to sign in and access the Internet and other guest services through a host's wireless, LAN or DMZ zones using passthrough authentication. Wireless Network Security Available as an integrated option on SonicWALL TZ300 through TZ500, IEEE 802.11ac wireless technology can deliver up to 1.3 Gbps of wireless throughput with greater range and reliability. 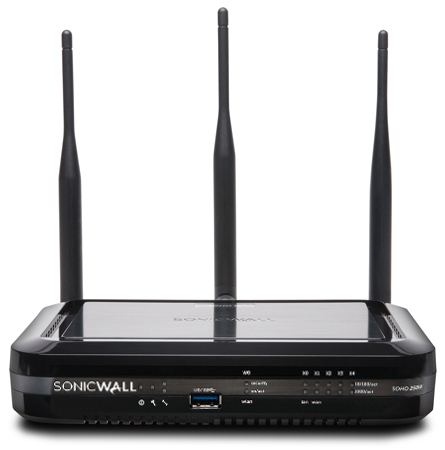 Optional 802.11 a/b/g/n is available on SonicWALL SOHO models. Cloud-based and on-premises management Configuration and management of SonicWALL appliances is available via the cloud through the SonicWALL Capture Security Center and on-premises using SonicWALL Global Management System (GMS). Powerful single device management An intuitive web-based interface allows quick and convenient configuration, in addition to a comprehensive command-line interface and support for SNMPv2/3. IPFIX/NetFlow application flow reporting Exports application traffic analytics and usage data through IPFIX or NetFlow protocols for real-time and historical monitoring and reporting with tools that support IPFIX and NetFlow with extensions. Auto-provision VPN Simplifies and reduces complex distributed firewall deployment down to a trivial effort by automating the initial site-to-site VPN gateway provisioning between SonicWALL firewalls while security and connectivity occurs instantly and automatically. IPSec VPN for site-to-site connectivity High-performance IPSec VPN allows the TZ series to act as a VPN concentrator for thousands of other large sites, branch offices or home offices. SSL VPN or IPSec client remote access Utilizes clientless SSL VPN technology or an easy-to-manage IPSec client for easy access to email, files, computers, intranet sites and applications from a variety of platforms. Redundant VPN gateway When using multiple WANs, a primary and secondary VPN can be configured to allow seamless, automatic failover and failback of all VPN sessions. Route-based VPN The ability to perform dynamic routing over VPN links ensures continuous uptime in the event of a temporary VPN tunnel failure, by seamlessly re-routing traffic between endpoints through alternate routes. User activity tracking User identification and activity are made available through seamless AD/LDAP/Citrix1/Terminal Services1 SSO integration combined with extensive information obtained through DPI. GeoIP country traffic identification Identifies and controls network traffic going to or coming from specific countries to either protect against attacks from known or suspected origins of threat activity, or to investigate suspicious traffic originating from the network. Provides the ability to create custom country and Botnet lists to override an incorrect country or Botnet tag associated with an IP address. Eliminates unwanted filtering of IP addresses due to misclassification. Regular expression DPI filtering Prevents data leakage by identifying and controlling content crossing the network through regular expression matching. Provides the ability to create custom country and Botnet lists to override an incorrect country or Botnet tag associated with an IP address. Multi-engine sandboxing The multi-engine sandbox platform, which includes virtualized sandboxing, full system emulation, and hypervisor level analysis technology, executes suspicious code and analyzes behavior, providing comprehensive visibility to malicious activity. Real-Time Deep Memory Inspection (RTDMI) This patent-pending cloud-based technology detects and blocks malware that does not exhibit any malicious behavior and hides its weaponry via encryption. By forcing malware to reveal its weaponry into memory, the RTDMI engine proactively detects and blocks mass-market, zero-day threats and unknown malware. Block until verdict To prevent potentially malicious files from entering the network, files sent to the cloud for analysis can be held at the gateway until a verdict is determined. Broad file type and size analysis Supports analysis of a broad range of file types, either individually or as a group, including executable programs (PE), DLL, PDFs, MS Office documents, archives, JAR, and APK plus multiple operating systems including Windows, Android, Mac OS X and multi-browser environments. Rapid deployment of signatures When a file is identified as malicious, a signature is immediately deployed to firewalls with SonicWALL Capture ATP subscriptions and Gateway Anti-Virus and IPS signature databases and the URL, IP and domain reputation databases within 48 hours. Capture Client Capture Client is a unified client platform that delivers multiple endpoint protection capabilities, including advanced malware protection and support for visibility into encrypted traffic. It leverages layered protection technologies, comprehensive reporting and endpoint protection enforcement. TLS/SSL decryption and inspection Decrypts and inspects TLS/SSL encrypted traffic on the fly, without proxying, for malware, intrusions and data leakage, and applies application, URL and content control policies in order to protect against threats hidden in encrypted traffic. Included with security subscriptions for all TZ series models except SOHO. Sold as a separate license on SOHO. SSH inspection Deep packet inspection of SSH (DPI-SSH) decrypts and inspect data traversing over SSH tunnel to prevent attacks that leverage SSH. Countermeasure-based protection Tightly integrated intrusion prevention system (IPS) leverages signatures and other countermeasures to scan packet payloads for vulnerabilities and exploits, covering a broad spectrum of attacks and vulnerabilities. Automatic signature updates The SonicWALL Threat Research Team continuously researches and deploys updates to an extensive list of IPS countermeasures that covers more than 50 attack categories. The new updates take immediate effect without any reboot or service interruption required. Intra-zone IPS protection Bolsters internal security by segmenting the network into multiple security zones with intrusion prevention, preventing threats from propagating across the zone boundaries. Botnet command and control (CnC) detection and blocking Identifies and blocks command and control traffic originating from bots on the local network to IPs and domains that are identified as propagating malware or are known CnC points. Protocol abuse/anomaly Identifies and blocks attacks that abuse protocols in an attempt to sneak past the IPS. Zero-day protection Protects the network against zero-day attacks with constant updates against the latest exploit methods and techniques that cover thousands of individual exploits. Anti-evasion technology Extensive stream normalization, decoding and other techniques ensure that threats do not enter the network undetected by utilizing evasion techniques in Layers 2-7. Gateway anti-malware The RFDPI engine scans all inbound, outbound and intra-zone traffic for viruses, Trojans, key loggers and other malware in files of unlimited length and size across all ports and TCP streams. Capture Cloud malware protection A continuously updated database of tens of millions of threat signatures resides in the SonicWALL cloud servers and is referenced to augment the capabilities of the onboard signature database, providing RFDPI with extensive coverage of threats. Around-the-clock security updates New threat updates are automatically pushed to firewalls in the field with active security services, and take effect immediately without reboots or interruptions. Bi-directional raw TCP inspection The RFDPI engine is capable of scanning raw TCP streams on any port bi-directionally preventing attacks that they to sneak by outdated security systems that focus on securing a few well-known ports. Extensive protocol support Identifies common protocols such as HTTP/S, FTP, SMTP, SMBv1/v2 and others, which do not send data in raw TCP, and decodes payloads for malware inspection, even if they do not run on standard, well-known ports. Application control Control applications, or individual application features, that are identified by the RFDPI engine against a continuously expanding database of over thousands of application signatures, to increase network security and enhance network productivity. Custom application identification Control custom applications by creating signatures based on specific parameters or patterns unique to an application in its network communications, in order to gain further control over the network. Application bandwidth management Granularly allocate and regulate available bandwidth for critical applications or application categories while inhibiting nonessential application traffic. Granular control Control applications, or specific components of an application, based on schedules, user groups, exclusion lists and a range of actions with full SSO user identification through LDAP/AD/Terminal Services/Citrix integration. Inside/outside content filtering Enforce acceptable use policies and block access to HTTP/HTTPS websites containing information or images that are objectionable or unproductive with Content Filtering Service and Content Filtering Client. Enforced Content Filtering Client Extend policy enforcement to block internet content for Windows, Mac OS, Android and Chrome devices located outside the firewall perimeter. Granular controls Block content using the predefined categories or any combination of categories. Filtering can be scheduled by time of day, such as during school or business hours, and applied to individual users or groups. Web caching URL ratings are cached locally on the SonicWALL firewall so that the response time for subsequent access to frequently visited sites is only a fraction of a second. Multi-layered protection Utilize the firewall capabilities as the first layer of defense at the perimeter, coupled with endpoint protection to block, viruses entering network through laptops, thumb drives and other unprotected systems. Automated enforcement option Ensure every computer accessing the network has the appropriate antivirus software and/or DPI-SSL certificate installed and active, eliminating the costs commonly associated with desktop antivirus management. Automated deployment and installation option Machine-by-machine deployment and installation of antivirus and anti-spyware clients is automatic across the network, minimizing administrative overhead. 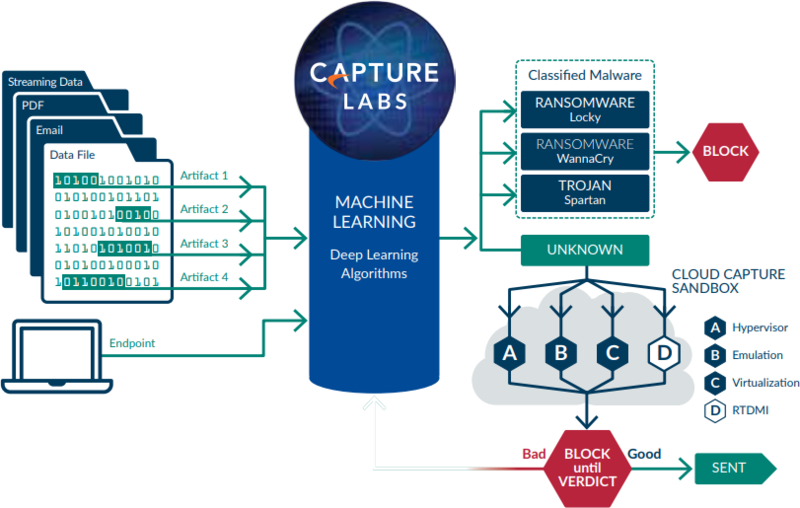 Next-generation antivirus Capture Client uses a static artificial intelligence (AI) engine to determine threats before they can execute and roll back to a previous uninfected state. Spyware protection Powerful spyware protection scans and blocks the installation of a comprehensive array of spyware programs on desktops and laptops before they transmit confidential data, providing greater desktop security and performance. SonicWALL's Capture Cloud Platform delivers cloud-based threat prevention and network management plus reporting and analytics for organizations of any size. The platform consolidates threat intelligence gathered from multiple sources including our award-winning multi-engine network sandboxing service, Capture Advanced Threat Protection, as well as more than 1 million SonicWALL sensors located around the globe. If data coming into the network is found to contain previously-unseen malicious code, SonicWALL's dedicated, in-house Capture Labs threat research team develops signatures that are stored in the Capture Cloud Platform database and deployed to customer firewalls for up-to-date protection. New updates take effect immediately without reboots or interruptions. The signatures resident on the appliance protect against wide classes of attacks, covering tens of thousands of individual threats. In addition to the countermeasures on the appliance, TZ firewalls also have continuous access to the Capture Cloud Platform database which extends the onboard signature intelligence with tens of millions of signatures. 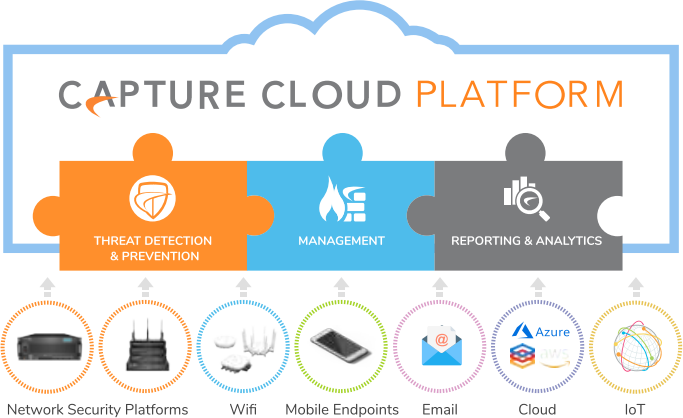 In addition to providing threat prevention, the Capture Cloud Platform offers single pane of glass management and administrators can easily create both real-time and historical reports on network activity. At the center of SonicWALL automated, real-time breach prevention is SonicWALL Capture Advanced Threat Protection service, a cloud-based multi-engine sandbox that extends firewall threat protection to detect and prevent zeroday threats. Suspicious files are sent to the cloud where they are analyzed using deep learning algorithms with the option to hold them at the gateway until a verdict is determined. The multi-engine sandbox platform, which includes Real-Time Deep Memory Inspection, virtualized sandboxing, full system emulation and hypervisor level analysis technology, executes suspicious code and analyzes behavior. When a file is identified as malicious, it is blocked and a hash is immediately created within Capture ATP. Soon after, a signature is sent to firewalls to prevent follow-on attacks. The service analyzes a broad range of operating systems and file types, including executable programs, DLL, PDFs, MS Office documents, archives, JAR and APK. For complete endpoint protection, the SonicWALL Capture Client combines next-generation anti-virus technology with SonicWALL's cloud-based multi-engine sandbox. The SonicWALL Reassembly-Free Deep Packet Inspection (RFDPI) is a singlepass, low latency inspection system that performs stream-based, bi-directional traffic analysis at high speed without proxying or buffering to effectively uncover intrusion attempts and malware downloads while identifying application traffic regardless of port and protocol. This proprietary engine relies on streaming traffic payload inspection to detect threats at Layers 3-7, and takes network streams through extensive and repeated normalization and decryption in order to neutralize advanced evasion techniques that seek to confuse detection engines and sneak malicious code into the network. Once a packet undergoes the necessary pre-processing, including TLS/SSL decryption, it is analyzed against a single, proprietary memory representation of three signature databases: intrusion attacks, malware and applications. The connection state is then advanced to represent the position of the stream relative to these databases until it encounters a state of attack, or other "match" event, at which point a pre-set action is taken. In most cases, the connection is terminated and proper logging and notification events are created. However, the engine can also be configured for inspection only or, in case of application detection, to provide Layer 7 bandwidth management services for the remainder of the application stream as soon as the application is identified. For highly regulated organizations wanting to achieve a fully coordinated security governance, compliance and risk management strategy, SonicWALL provides administrators a unified, secure and extensible platform to manage SonicWALL firewalls, wireless access points and Dell N-Series and X-Series switches through a correlated and auditable workstream process. Enterprises can easily consolidate the management of security appliances, reduce administrative and troubleshooting complexities, and govern all operational aspects of the security infrastructure, including centralized policy management and enforcement; real-time event monitoring; user activities; application identifications; flow analytics and forensics; compliance and audit reporting; and more. In addition, enterprises meet the firewall's change management requirements through workflow automation which provides the agility and confidence to deploy the right firewall policies at the right time and in conformance with compliance regulations. Available on premises as SonicWALL Global Management System and in the cloud as Capture Security Center, SonicWALL management and reporting solutions provide a coherent way to manage network security by business processes and service levels, dramatically simplifying lifecycle management of your overall security environments compared to managing on a device-by-device basis. Because of their flexibility, TZ series firewalls are ideally suited for both distributed enterprise and single site deployments. In distributed networks like those found in retail organizations, each site has its own TZ firewall which connects to the Internet often through a local provider using a DSL, cable or 3G/4G connection. In addition to Internet access, each firewall utilizes an Ethernet connection to transport packets between remote sites and the central headquarters. Web services and SaaS applications such as Office 365, Salesforce and others are served up from the data center. Through mesh VPN technology, IT administrators can create a hub and spoke configuration for the safe transport of data between all locations. 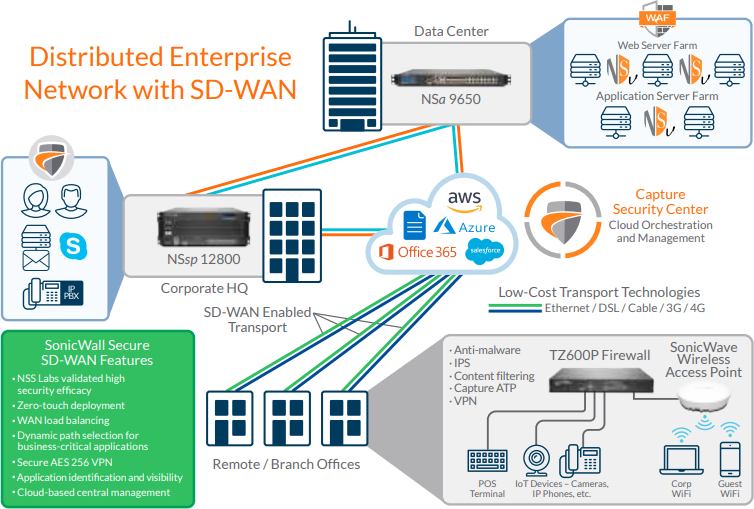 The SD-WAN technology in SonicOS is a perfect complement to TZ firewalls deployed at remote and branch sites. Instead of relying on more expensive legacy technologies such as MPLS and T1, organizations using SD-WAN can choose lower-cost public Internet services while continuing to achieve a high level of application availability and predictable performance. Tying the distributed network together is SonicWALL's cloud-based Capture Security Center (CSC) which centralizes deployment, ongoing management and real-time analytics of the TZ firewalls. A key feature of CSC is ZeroTouch Deployment. Configuring and deploying firewalls across multiple sites is time-consuming and requires onsite personnel. However ZeroTouch Deployment removes these challenges by simplifying and speeding the deployment and provisioning of SonicWALL firewalls remotely through the cloud. Similarly, CSC eases ongoing management by providing cloud-based single-pane-of-glass management for SonicWALL devices on the network. For complete situational awareness of the network security environment, SonicWALL Analytics offers a single-pane view into all activity occurring inside the network. Organizations gain a deeper understanding of application usage and performance while reducing the possibility of Shadow IT. For single site deployments, having an integrated network security solution is highly beneficial. TZ series firewalls combine high security effectiveness with options such as built-in 802.11ac wireless and, in the case of the TZ300P and TZ600P, PoE/PoE+ support. The same security engine in our mid-range NSa series and high-end NSsp series is featured in TZ series firewall along with the broad feature set of SonicOS. Configuration and management is easy using the intuitive SonicOS UI. Organizations save valuable rack space due to the compact desktop form factor. For wired and wireless small and home office environments, the SonicWALL SOHO 250 and SOHO series deliver the same businessclass protection large organizations require at a more affordable price point. Add optional 802.11n wireless to provide employees, customers and guests with secure wireless connectivity. 1 Testing Methodologies: Maximum performance based on RFC 2544 (for firewall). Actual performance may vary depending on network conditions and activated services. 2 Threat Prevention/GatewayAV/Anti-Spyware/IPS throughput measured using industry standard Spirent WebAvalanche HTTP performance test and Ixia test tools. Testing done with multiple flows through multiple port pairs. Threat Prevention throughput measured with Gateway AV, Anti-Spyware, IPS and Application Control enabled. 3 VPN throughput measured using UDP traffic at 1280 byte packet size adhering to RFC 2544. All specifications, features and availability are subject to change. 4 BGP is available only on SonicWALL TZ400, TZ500 and TZ600. Leverage SonicWALL Advanced Gateway Security Suite (AGSS) to deliver a multi-engine sandbox, powerful anti‐virus, anti‐spyware, intrusion prevention, content filtering, as well as application intelligence and control services. An upgrade over CGSS, this package features Capture Advanced Threat Protection (ATP), a multi-engine sandbox that runs and inspects suspicious files, programs and code in an isolated cloud-based environment. Enjoy the convenience and affordability of deploying your firewall as a SonicWALL TotalSecure solution. This combines the hardware and all the services needed for comprehensive network protection from viruses, spyware, worms, Trojans, key loggers and more - before they enter your network - and without the complexity of building your own security package. Get the most from your UTM firewall with the SonicWALL Comprehensive Security Suite (CGSS) subscription. CGSS includes Gateway Anti-Virus, Anti-Spyware, Intrusion Prevention, Application Intelligence and Control Service, Content/URL Filtering and 24x7 Support. Combine security, productivity and support in a single solution with a low cost of ownership and greater ROI compared with buying each of the services individually. Enable your small business firewall appliance to provide real-time network threat prevention with SonicWALL Gateway Anti-Virus, Anti-Spyware, Intrusion Prevention, and Application Intelligence and Control. Block the latest blended threats, including viruses, spyware, worms, Trojans, software vulnerabilities and other malicious code. Also, guarantee bandwidth prioritization and ensure maximum network security and productivity, with the granular control and real-time visualization with Application Intelligence and Control. The cloud-based SonicWALL Capture Advanced Threat Protection Service scans a broad range of files to detect advanced threats, analyzes them in a multi-engine sandbox, blocks them prior to a security verdict, and rapidly deploys remediation signatures. The result is higher security effectiveness, faster response times and a lower total cost of ownership. Gain a cost-effective, easy-to-manage way to enforce protection and productivity policies, and block inappropriate, unproductive and dangerous web content in educational, business or government environments. SonicWALL Content Filtering Service lets you control access to websites based on rating, IP address, URL and more. You get the ideal combination of control and flexibility to ensure the highest levels of protection and productivity, which you can configure and control from your small business firewall appliance, eliminating the need for a costly, dedicated filtering solution. Extend enforcement of your internal policies to devices located outside the firewall perimeter by blocking unwanted internet content with the Content Filtering Client. Extend the enforcement of web policies in IT-issued devices outside the network perimeter. Although it doesn't require a firewall, it can be optionally coupled with SonicWALL Content Filtering Service as an ideal combination to keep students and employees off of dangerous or non-productive websites by switching to cloud-enforced policies even when they are using roaming devices. Execute an innovative, multi-layered anti-virus internet security strategy, with SonicWALL firewalls and Enforced Client Anti-Virus and Anti-Spyware software. You get SonicWALL Reassembly-Free Deep Packet Inspection anti-malware at the gateway, and enforced anti-virus protection at the endpoints. You can redirect any user with a non-compliant endpoint to a web page to install the latest Enforced Client Anti-Virus and Anti-Spyware software. Provide automatically updated security definitions to the endpoint as soon as they become available to protect against today's rapidly evolving threats. Automate enforcement to minimize administrative overhead. Block threats from your email server and stop spam at the gateway by adding SonicWALL Comprehensive Anti-Spam Service (CASS) to your SonicWALL firewall. Rapidly deploy your spam firewall software with one-click activation of up to 250 users. Enjoy easy-to-use web-based traffic analytics and reporting, along with real-time and historical insight into the health, performance and security of your network. SonicWALL Analyzer supports SonicWALL firewalls and secure remote access devices while leveraging application traffic analytics for security event reports. Provide a complete solution that combines off-box application traffic analytics with granular statistical data generated by SonicWALL firewalls. Download the SonicWALL TZ Series Datasheet (PDF). The SonicWALL Comprehensive Anti-Spam Service delivers advanced spam protection at the gateway. Simply activate the service and stop spam before it enters your network. The Comprehensive Anti-Spam Service is recommended for up to 250 users. Additional Content Filtering Client Licenses are available, click here!